Introducing the revolutionary new Medusa Multihead Counter Pressure Bottle Filler. 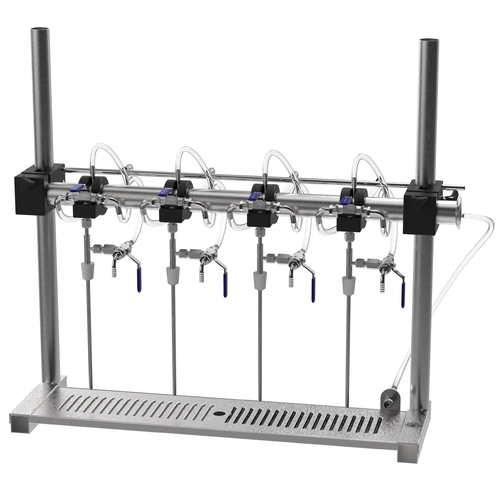 This unique unit is perfectly designed for the small craft brewer or dedicated home brewer. Finally, a counter pressure filler that can keep up with your bottling needs! Featuring 304 SS construction and high quality components, this unit is built to last. Reduce exposure to oxygen and increase your shelf life by bottling with this counter pressure filler. Both height and fill pressure are easily adjusted for all four filling heads simultaneously. After years of development, we are pleased to be able to offer such an amazing unit, at such a spectacular price! Sanitary 1.5" TC inlet for beer, 3/8" tube connection for CO2. Backpressure Bar allows for a single adjustment point for fill rates, no more adjusting PRVs on each fill head! Individual Purge Valves on each head allow nearly complete removal of all oxygen in a bottle. Keep your beer fresh longer!